I recently traveled with my wife to Istanbul as a 3 day stopover on our way back to the US from India, after marriage. As an Islamic country that lies at the cusp of Europe and Asia, it's culturally very intriguing. The VISA for getting into Turkey for Indian citizens is simple and can be done electronically, condition being that you already possess a valid VISA from the US, the UK or any Schengen country. The officer at the port of entry in Istanbul barely looked at the Turkey and US VISAs and almost immediately stamped our passports. 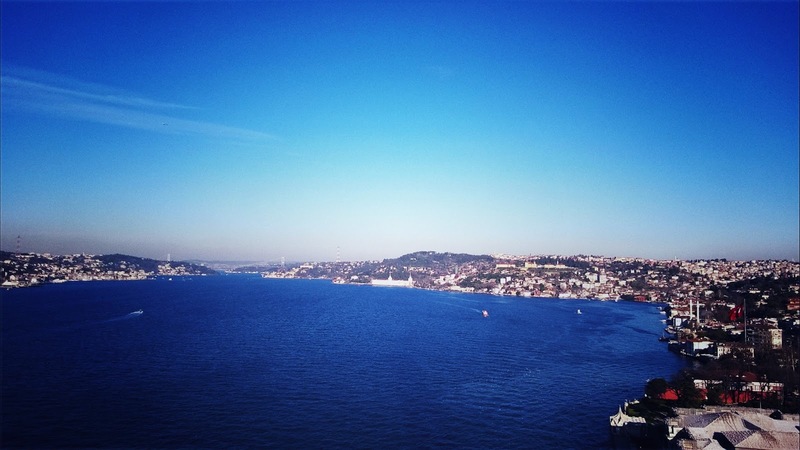 very scenic, as you get to admire the beauty of two continents, across the Bosphorous strait. Day 1: We started off the first day next morning, as I was sick the day we landed and rested almost the entire day. The first sights on the lists were the Sultan Ahmed aka the Blue mosque and Hagia Sophia. Built in the early 1600s, the blue mosque is a classic example of the Ottoman empire architecture. It's called 'blue' by the westerners because of the blue turquoise color tiling inside the mosque. Also, blue is considered as an important color in Islam. At the other end of the mosque across a very well maintained garden, is Hagia Sophia. A former Greek orthodox church, later a mosque and now a museum. Built in 537 AD by the Byzantine empire, it was later turned into a mosque by the Ottomans in 1437, and recently in 1931 into a museum by the Government of Turkey, to end the religious debate. As a result, the insides of this building have both Islamic and Christian traces from their respective pasts. Evening, we decided on doing a 2 hour sunset cruise across the Bosphorous. They start at the coast near Blue mosque and go along the way to the Asian side before dropping you off at the same point. The cruise is awesome for getting panoramic views of this magnificent city and it's important landmarks including the mosques and palaces. Day 2: Next day, we decided to do the "Big bus" tours of the city. A 48 hours pass costs about $38 per person, and they provide audio guides and WiFi while on the bus. The bus has two routes, one that takes you through the modern landmarks of the city and the other one that takes you across to the Asian side of the city over the Bosphorous bridge. Day 3: The last day, we decided to do the tour of the Topkapı palace, which is walking distance from the mosque. The Topkapi Palace functions as a museum and only a very small part of its original domain and environment can be seen. Over time there has been destruction (by fire) and the demolition (through new building) of many of its original structures. Despite this, the original 15th century spatial organization based on a triple courtyard has remained remarkably intact. Try booking a hotel near the Blue mosque area as all the main attractions are walking distance from there. Exchange USD for Liras rather than Euros to get a better rate, or even better use credit cards where possible, as they have the best exchange rates.